RRS Discovery departed Port Stanley in the Falkland Islands at 18.25 on 12th March 2019 heading for Tristan da Cunha. The 5954 tonne research vessel built in 2013 will undertake Blue Belt research around the Tristan da Cunha Islands and St Helena, before heading to Walvis Bay where the ship is expected to arrive on 21st April. The team will focus on exploring Tristan da Cunha's underwater sea-mounts or guyots. On arrival scientists will map the ocean floor, collect biological specimens from trawls, gather water samples from the ocean, and deploy deep water cameras that can operate at depths in excess of 1000 metres. 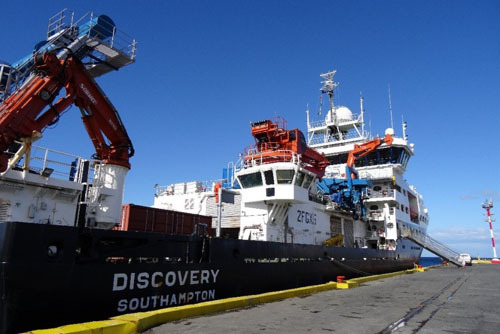 The expedition, known as Discovery Expedition 100, is the second marine survey Tristan da Cunha has seen in recent years. 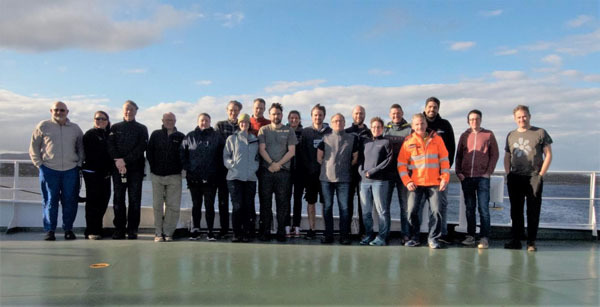 During the last survey on the RRS James Clark Ross the team mapped an underwater mountain, donated thousands of ocean animal specimens to the Natural History Museum and even discovered a possible new species of octopus. 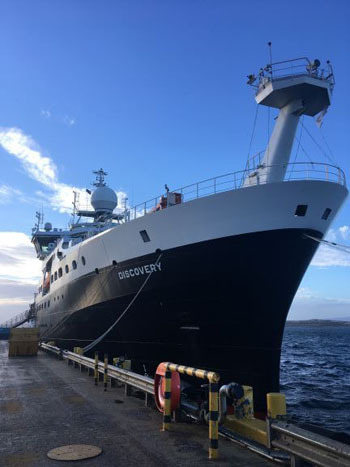 This year's expedition is a joint Cefas Blue Belt Programme and British Antarctic Survey Overseas Development Assistance project in partnership with the Natural History Museum. It is part of the Blue Belt Programme, which supports the delivery of the UK Government's commitment to enhance marine protection of over four million square kilometres of marine environment across UK Overseas Territories. The team of scientists gathered on the deck of the RRS Discovery prior to departure from Port Stanley. Cefas' lead Blue Belt Programme Scientist Dr Martin Collins explains, "our knowledge of Tristan da Cunha and St Helena's marine environment is surprisingly scarce. Last year's marine survey significantly improved the information we hold - but there's so much more to discover. The better we understand these ecosystems and the marine life they support, the better scientific advice we can offer on how to protect biodiversity and support thriving ecosystems." Dr Simon Morley, ecophysiologist and Principal British Antarctic Survey Scientist on the project, says: "the seas around Tristan da Cunha and St Helena are crucial for the islands economies, which rely heavily on fisheries and tourism as well as their cultural identity, which is inextricably linked to the ocean. This research cruise is part of a 3-year project which aims to provide the islanders with improved tools and the information required to manage their marine ecosystem into the future." RRS Discovery photos above and top are from previous expeditions. We are in touch with Martin Collins, Simon Morley and Stephanie Martin - Tristan Conservation Department Environmental and Conservation Policy Officer, who are all on board who will provide photographs and a report for the August Tristan da Cunha Newsletter to compliment posts on www.tristandc.com as the expedition progresses.